.. During the 1920s and 1930s, Army Nurses wore an olive-drab outdoor uniform similar to that of commissioned Army officers. It was rarely used by many nurses since there was no regulation which made its wear obligatory at all times. 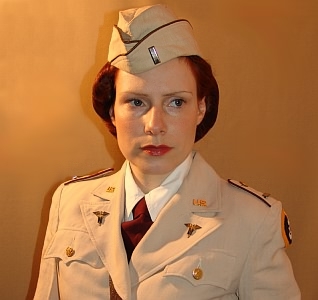 When in 1940 it was deemed necessary to increase the strength of the Army Nurse Corps, considerations were made to improve the completely outmoded outdoor uniform in design and color. A more feminine cut and a more becoming color were intended. 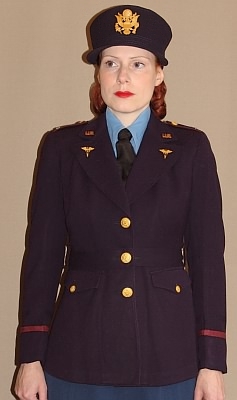 Finally, a two-tone blue uniform was chosen with a dark blue jacket and a medium blue skirt.
. In 1940, the Office of the Quartermaster General designed the new blue service uniform for Army Nurses. However, a number of complications during the production process caused a big delay. beige stockings with black oxford shoes ..... Therefore, only nurses with overseas orders received the new uniform at first, while nurses remaining on domestic duty had to wait until sufficient stocks of the new uniform were procured. At the beginning of 1942, the nurses still were not fully equipped with the blue uniform. worn with 1st pattern Service cap. The blue uniform soon proved unsatisfactory. It was cut on masuline lines not adapted to the female figure. The jacket did not have enough fullness across the shoulders and the bust, the sleeves were too short and set in at the angle as it was common in men's clothes. The skirt was too large at the waist and too small at the hips. The sizing as well as the basic pattern needed corrections. Slight changes were appoved in early 1942, but the garments remained inadequate all in all. In September 1942, it was decided to discontinue the procurement of the blue uniform. The color of the uniform was changed into olive drab and a new pattern was adopted. However, nurses could coninue to wear the blue uniform as a dress uniform until the end of war. After the effective date of change to olive-drab, no blue uniforms were issued anymore, but could be purchased at the nurse's own expense. The jacket of the blue service uniform was made of dark blue covert wool. It was equipped with maroon piped epaulets and maroon sleeve braids. The jacket was closed with three gilt Army buttons and had two hip pockets with buttoned flaps. The jacket was worn with a six gore skirt in medium blue color.
. The effective date of change to olive-drab was delayed several times since large surplus stocks of blue uniforms should be utilized first. Eventually, the change was made effective on July 1, 1943 for nurses overseas or alerted for overseas. The uniform change for nurse's in the continental United States was set on December 3, 1943. It was intended to have all nurses properly equipped in olive-drab no later than June 1944. The design was similar to the revised Women's Auxiliary Army Corps (WAAC) uniform. The olive-drab uniform was available in winter and summer weight material. For the winter uniform 14 1/2 ounce barathea was used and tropical-worsted for the summer uniform . Dark olive-drab jacket worn with lightshade drab ("pink") skirt and male pattern garrison cap. . In the summer of 1943, it was deemed more and more necessary to provide Army nurses with slacks. More complete protection and freedom of movement was required at several jobs overseas. Therefore, many nurses already had started to wear privately purchased slacks in all kind of colors and with no uniformity of cut or style. This development should be stopped with the introduction of woolen slacks. In August 1943, the design of the slacks was approved and the Quartermaster Corps started to produce the slacks for resale to nurses in overseas areas. The fabric and color of the slacks matched the olive-drab service jacket. The slacks were available in summer weight and winter weight material. The slacks had a zipper closure or button closure and a pocket on the right side. Dark od (with zipper closure) .
. ETO Field Uniform . In 1944, Army Nurses who served in the European Theater of Operations (ETO) were authorized to wear short-waisted battle jackets. Similar jackets were already used by British Army personnel (including their female staff) and adopted for the female U.S. Army personnel in October 1944 because it was noticed that these jackets were more practical to wear for many jobs. The battle jacket allowed more freedom of movement. Therefore, it provided more comfort for outdoor jobs than the usual hip length service jackets. Before the decision about the concrete design was made, the wearing of the "Jacket, Field, Wool, Women's" was already approved. This caused different variations of the pattern. The field jacket could be worn with matching skirt or slacks like shown in the photos below. 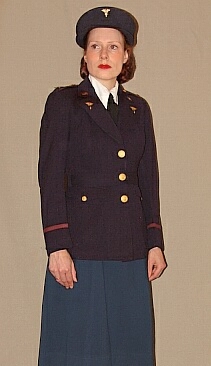 The use of a beige, summer service uniform, purchased by the nurse, had been optional since 1941. It was made in the same style as the blue service uniform but without belt. Like the blue uniform it had maroon piped shoulder straps and a maroon mohair officer's sleeve braid. The uniform was worn with a white shirt, black tie, white gloves, beige hose and white oxford style shoes. Later, it was also permitted to wear the uniform with brown accessories. 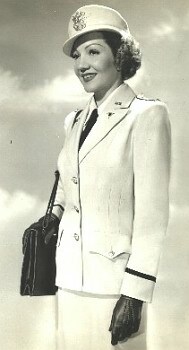 In 1943, a revised beige service uniform was introduced. The same pattern as for the olive-drab uniform was used. Like on the previous version, the sleeves were trimmed with maroon braid and the shoulder loops had a maroon piping. A maroon tie replaced the black tie worn with the previous version of the summer uniform. The beige dress was worn with a matching beige visored cap or an overseas style cap with maroon piping. Later, the nurses were provided with a beige garrison cap with gold-black officer's piping like shown in the picture above. The wear of the cotton seersucker uniform with jacket was designated for street wear off-duty. In this combination, it was an optional summer service uniform for nurses. The collarless jacket had two patch pockets and a one-button front closure. The collar of the dress was placed over the jacket. The jacket became an item of issue and was standarized in December 1942. The olive drab service cap, the beige service cap, the olive drab garrison cap or the beige garrison cap could be worn with this service uniform. Additionally, the russet brown service shoes or low white shoes and white, beige or Army russet brown gloves were authorized. .. In the summer of 1942, the addition of a light-weight, beige dress was requested for nurses serving in hot climates. In August, the beige dress was approved as item of purchase. Plain weave rayon or tropical worsted was chosen as material which could be used for both, the blue or beige dress. With the change from blue to olive-drab, an olive-drab dress of the same design was authorized in April 1943. Although at first the blue dress should be discarded, it later was allowed to continue the wear of the blue dress as well as an off-duty dress in drab blue, wool gabardine in the continental United States only. The dark olive-drab winter dress was made of rayon. In the summer/autumn of 1944, an improved version made of wool crepe in olive-drab shade 51 was introduced. The width of the shoulders was increased, the waistline and the pocket size reduced, the braid from the shoulder loops omitted and the cuffs modified into a double or French type of cuff. The wear of plain brown pumps with the off-duty dress was authorized in September 1945. Note: The U.S. letters were worn on the right side of the collar and the nurse's caduceus on the left side of the collar.